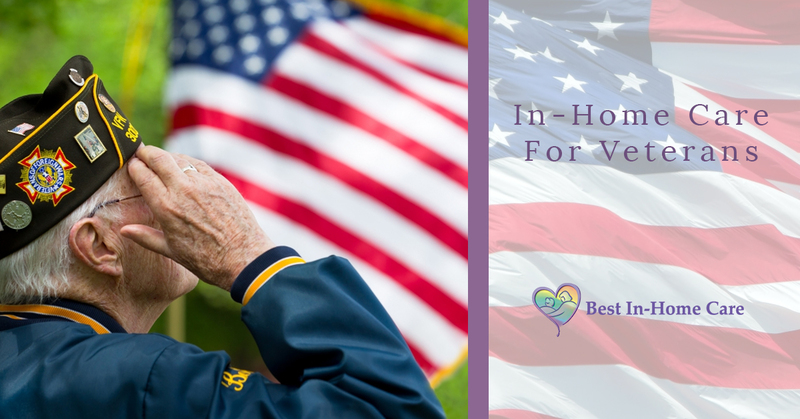 Best In-Home Care is grateful for the service that veterans and their spouses have given our country, and provide Veteran’s Benefits for qualifying service members who need in-home senior care. While in-home care is often covered for veterans, many veterans do not seek assistance in their own home. This can be for several reasons. While our military today works hard to encourage veterans to seek help for mental and physical illnesses that may or may not be a result of wartime experiences, many older veterans come from an era where accepting help is a sign of weakness. While most veterans qualify for benefits, they would rather struggle on their own than admit they need assistance. This is why it is important to choose a senior care company that is committed to providing veterans with the care they deserve while maintaining their dignity every step of the way. Best In-Home Care offers veteran-specific care ranging from meal preparation to transportation and personal hygiene. Our caregivers for veterans are aware that some vets may feel embarrassed about needing help, and ensure that their patients are treated with the utmost respect that they deserve. Another reason that many veterans and their families do not seek in-home elder care is because there is a lot of confusion around who is qualified for benefits. Best In-Home Care offers application assistance to help make the process less complicated and ensure that you or your loved one receive proper care. Some qualifications to receive veteran benefits include wartime services during WWII, or the Korean, Vietnam, or Gulf Wars. The veteran must have honorable discharge, and have served for at least 90 days on active duty with at least one day served during wartime. There are a few other qualifications, but veterans who meet the qualifications are eligible for in-home care for themselves, spouses, or widows. There are benefits to at-home care for seniors that translate especially well to veterans and spouses of veterans. Veterans and spouses whose partner has passed away can benefit from having another person in the home simply for the company. Many seniors become isolated as they age, even when they have family members who visit them. A caregiver can provide conversation and companionship as well as care. Even if your veteran and their spouse are both living, a caregiver can help ease the responsibility from the other partner. Many spouses sacrifice their own health and well-being to take care of their partner. A caregiver can release this burden and allow the veteran and their spouse to enjoy their time together without worrying about things like cooking, cleaning, and transportation. In-home senior care also allows for veterans to maintain dignity and live in their own homes. Many families dread the day they have to put their aging parents or siblings “in a home” when they can no longer take care of themselves. A Best In-Home Care, you have the option of part-time care, or 24/7 care if needed. This allows veterans and their spouses to stay in their own homes and maintain a normal life while still receiving the help they need. If your spouse, sibling, or parent is a veteran who needs help with daily living, contact Best In-Home Care for a free in-home evaluation. We are dedicated to providing veterans with compassionate care to maintain their dignity and well-being as they age. Give us a call today to find out more about our services.